Unique settings, different ecosystems and the conservation of the White Rhino are outstanding features of KwaZulu-Natal Game Reserves in South Africa. Meet Hippo, Crocodile and all of the Big Five animals in famous reserves like the Greater St Lucia Wetland Park, Phinda or Tembe. Explore the underwater world of Sodwana Bay, relax on beautiful beaches, go fishing or scuba diving and hike on wonderful trails. Bird watching is also great at the beautiful and fascinating KwaZulu-Natal Game Reserves. Hluhluwe-Umfolozi is located in Northern KwaZulu-Natal and home of the Big Five animals, namely Elephant, Buffalo, Lion, Rhino and Leopard and many other species as well as prolific birdlife. This prestigious reserve is famous for bringing the White Rhino numbers back from extinction and continued advances in setting benchmarks in conservation. Through careful management, the rhinos have multiplied and are annually exported to other reserves. This KwaZulu-Natal game reserve is a tropical wilderness with rolling bush-covered hills and savannah. Game viewing is the main attraction here and there are a number of hides, pans and waterholes to give visitors opportunities for close range viewing. The Lion population here is descended from a lone male Lion who some 50 years ago travelled of his own accord, over an amazing distance, from Mozambique to Umfolozi where he eventually formed a pride of his own. Wilderness trails and guided walks are available in the reserve and self-drive routes with information packs. This unique private game reserve in KwaZulu-Natal spans seven different ecosystems including rare sand forest, giving visitors an unrivalled safari experience between the Ubombo Mountains and the sea. Phinda Private Game Reserve prides itself on the variety of wildlife safari and sea activities. The reserve is located in Zululand, northern KwaZulu-Natal between the magnificent Greater St Lucia Wetlands Marine Reserve (a World Heritage Site) and the Mkuzi Game Reserve. All Big Five animals can been found here amongst a prolific amount of other wildlife and more than 300 bird species. In the near of Phinda is the exquisite beach and underwater world of Sodwana Bay, rich in coral reefs and colourful tropical fish said to match the likes of the Great Barrier Reef. Freshwater lakes and floodplains attract Crocodile, Hippo and waterbirds, and the pristine beaches are the breeding ground for Leatherback Turtles. Tembe is KwaZulu-Natal's 3rd largest game reserve. The reserve is located in Maputaland, in the far north bordering Mozambique. This is the home of South Africas last remaining free-ranging indigenous African Elephant herd whom at one time moved between here and Mozambique, but in recent times they have retreated to Tembes dense sand forests to escape border unrest and conflicts as well as poaching. Tembe is also a sanctuary to a host of other animals including Black and White Rhino, Buffalo, Lion, Leopard, Giraffe, Wildebeest, Hippo, Zebra, Serval, Hyena, Jackal and many other species of antelope like Eland and Kudu through to the delicate Suni. There are around 340 bird species some of them are rare such as Rudds apalis, the Natal nightjar and Woodwards batis. Itala overlooks the ancient Pongola River Valley in the rugged mountainous thornveld of northern KwaZulu-Natal. Some of the oldest rock formations can be found here going back millions of years. This is frontier country and the site of many historic events and battles of the Zulu Kings including Shaka, as well as the Anglo-Boer war, but also going much further back in time evidenced by the archaeological finds from 20 000 years ago and into the stone age. This is scenically an extremely beautiful area with diverse habitats, flora and fauna; the ranging topography varies greatly from the dense lowveld valleys to the high plateau grasslands. The larger game species that reside at Itala Game Reserve include White and Black Rhino, Elephant, Buffalo and Giraffe. Also seen are Zebra, Blue Wildebeest and a wide variety of antelope. Lion are not found here. Other predators in the reserve but not often seen are Leopard as well as Brown and Spotted Hyena. Over 300 bird species make for a birdwatchers paradise. Mkuzi is a nature-lovers heaven with great a diversity of habitats and high contrasts. It has a large game population and the scenery is spectacular. The Lebombo Mountains form the eastern boundary and there are wide stretches of acacia savannah, swamps, woodlands and riverine forest. A forest of fig trees grows along the banks of the Mkuzi River. This reserve in KwaZulu-Natal borders the Greater St Lucia Wetlands Park and Marine Reserve (a World Heritage Site). There are a number of hides and pans around which the animals gather making excellent photographic opportunities. Animals that reside here include Black and White Rhino, Elephant, Leopard, Buffalo, Giraffe, Nyala, Blue Wildebeest, Warthog, Impala, Kudu and other smaller antelope. 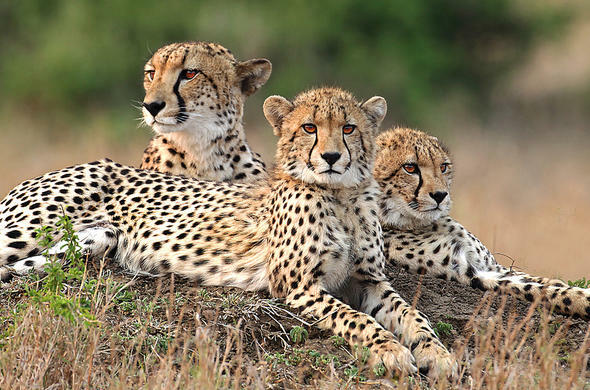 Rare species not often seen are Cheetah, Hyena and Suni. A traditional Zulu village in the reserve provides opportunities for cultural visits. This beautiful reserve is situated close to the Swaziland border in northern KwaZulu-Natal. The original reserve has since been re-proclaimed, in part, as the Phongolo Nature Reserve, which is the present Pongola Game Reserve's immediate neighbour. It is the oldest reserve in South Africa providing sanctuary to over 300 species of bird and a range of plains, game which includes Elephant, White Rhino, Giraffe, Blue Wildebeest, Zebra, Kudu, Suni, Impala, Nyala, Warthog, Waterbuck as well as Reedbuck. The Greater St Lucia Wetlands Park and Marine Reserve in KwaZulu-Natal is incredibly beautiful and a World Heritage Site. The complex diversity of habitats is awesome with marine systems of coral reefs and beaches, coastal forests, salt and fresh water marshes, open estuarine waters of Lake St Lucia, lush coastal plains and drier woodland areas. Stretching for 280km (174 miles) from Kosi Bay in the north down the coast to Mapelane in the south, this protected reserve is home to a vast array of plant and animal life. Humpback Whales are regular visitors at St Lucia's shores; on land animals include Elephant, Buffalo, Rhino, Zebra, Eland, Kudu and an astonishing amount of birds, over 500 species of wetland, marine and forest birds live or pass through here. The St Lucia Wetlands Park is a popular holiday destination with a wide range of activities available including wilderness horseback safaris, fishing, boating and bird watching, also scuba diving, hiking and camping. Species as Hippo and Crocodiles inhabit waterways and the coastal plains. There are endless opportunities and settings for Photographers for finding the perfect picture. This KwaZulu-Natal reserve is best known for its magnificent bird life with the highest bird count in South Africa, some 430 species which amounts to 60% of all bird species found in South Africa. It is situated near the Tembe Elephant Park on the Mozambique border. Ndumo boasts many beautiful pans, yellow fever trees and extensive wetlands, reedbeds as well as acacia savannah and sand forest, the Usuthu River and Pongola Rivers form and flow through the reserve. Animals in the Ndumo Game Reserve include good numbers of Black and White Rhino, Buffalo, Hippo and Crocodile, Giraffe, Red Duiker, Nyala and Suni, Leopard and Hyena may also be seen. The reserve offers game drives and guided wilderness walks. Zululand Rhino Reserve in northern KwaZulu-Natal has been declared an international site of ecological significance due to the fact that it preserves the Black Rhino population but also because of the unique species of birds, insects and plants that occur here. This reserve is a haven for the endangered Black Rhino which was poached to near extinction between 1970 and 1990. This 23 000 hectare reserve in KwaZulu-Natal has a wide variety of habitats and spectacular scenery from dense thickets to riverine forests, bushveld and broadleaf woodlands to acacia savannah. There are lovely river walks sheltered by sycamore figs and weeping farmer bean trees. Animals like White Rhino, Elephant, Buffalo, Giraffe, Blue Wildebeest and various antelope species from Kudu to the rare Suni can also be found at the Zululand Rhino Reserve. Hyena and Leopard are also present. Many birds live here including Lemon breasted canary, Pink throated twinspot and Narina Trogan. Guests can experience the scenic South African bush in KwaZulu-Natal on their safari holiday at Nambiti Plains Private Game Lodge. Visitors can also see the Anglo-Zulu Battlefields or take part in a conference at this lodge.